@Jazen I know just when we think we seen all the glitches more new and interesting ones come out. I lost count with how many things can go wrong with this game. Oh well Chelsea and Neal have a new home in Barnacle Bay. I never played that world so I'm eager to try it out. I'll post a picture of the new baby as soon as I am able. A little bit of Chelsea came through in the new one but he is mostly Neal. You said it about not gaining weight! 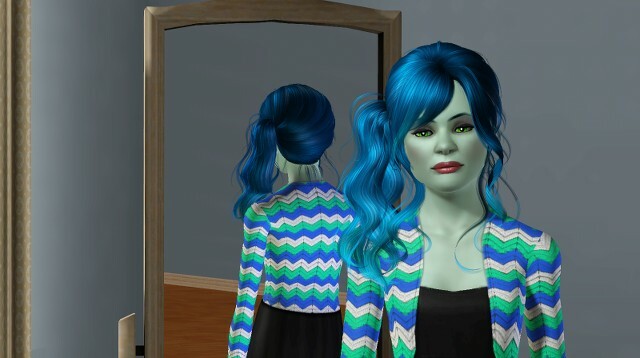 If only I could live life as a sim. @HollyhocksFluff I'm so happy to hear that they are re opening your thread this is wonderful news and I can't wait to get caught up with the family again. You know I still do Mugsy sightings when I send someone to university. @Everyone I neglected this story for almost a year but Katherine and Jeremy are back. Edit-It seems that my daughter just handed me an Amazon Gift Card that she received as a teacher gift. It turns out that the day care she works for charges $20 K to send their kids there and most of the parents are professionals who make nice salaries. (Keeping my fingers crossed that one of them is a Single Dad LOL!) Now that this term is over they were giving her plenty of gifts so she handed this one to me. I have enough for 2 stuff packs or 1 game pack. Anyone have any suggestions on which is the best to buy? @Piazzagirl1015 yes, EA keeps us on our toes with the glitches that can come up. Hope you like Barnacle Bay. I liked it when I played there for As Life Goes. It's a town that runs fairly well too, so yay for that. LOL Neal and his strong genes. Just what you want in a perfect genetics challenge. I need to get back to mine and hope one of my couples gives me an heir soon enough. Read and commented on your update. Also, I want to apologize in advance for the influx of updates you will get on your dash today. I'm going to start moving my Rebuild Willow Creek updates over from the thread to the blog today. Yesterday I just played my iron woman game since I'm not in the mood to write. Have enough for 2 updates (I really take too many pictures) so one now, and maybe one later, we'll see. @Jazen I guess EA doesn't want us to get bored and they are throwing some new ways to keep us busy. Right now I'm searching for a house for them. I remember you sending me a link one time for houses and I'm seeing if I can find something nice for the Wyman family and possibly get them in there. I'm starting to get a feel for Catalina as she seems like such a sad soul to me. Her parents are so alive and full of energy but she doesn't seem to have inherited that from them. Here is a picture of her. I guess this is trouble for me when my just for fun sims start speaking out to me or maybe she worried she will have to have more babies than Raven to find a perfect genetic heir. @MischiefTheKitten gave me Illusion from whispers as her future husband maybe he will cheer her up a bit. I'll be keeping my fingers crossed for you for when you go back into your PG game as I know how frustrating it can be. The second two children that Chelsea and Neal had were not PG heirs even when the DNA is as strong as Neal's. No need to apologize about the updates and I do hope that you can get that all sorted out quickly and easily. I don't know what her working out has to do with science but I sent her to do it anyway. 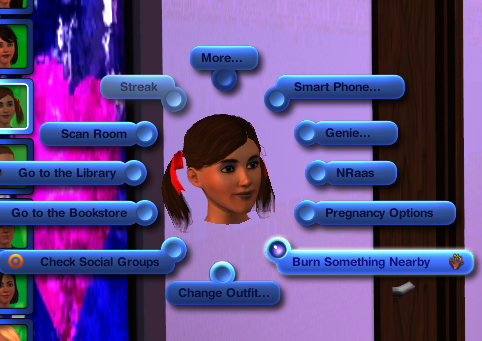 She is also having fun with that Sim Ray. 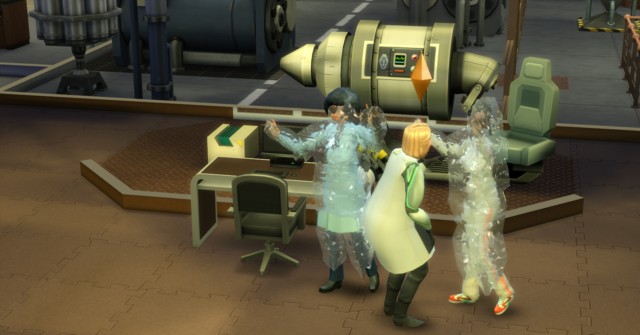 I think she is becoming a mad scientist because after she makes her co workers change their clothes she freezes them with it and she has an evil laugh. She is on Level 8 of the science career so she should be maxing that soon. More from Marissa last night. I love the fact that her friends call her up to go out to dinner to celebrate promotions. Raquel from work did just that and here they are having some white wine with whatever they ordered. I don't remember what it was but she can make the dish now at her chef station. With the giftcard I had from my daughter I ended up getting the last EP which is still $29.99 at Amazon but after the gift card it was $9.99 which is not bad for an EP. Since she can join clubs we will look for one or start one called weight watchers. @Piazzagirl1015 I guess you're right. EA likes to keep us on our toes so we don't get too comfortable. I think it's the mouth on Catalina that makes her seem so sad looking. It worked for Neal to have that wide set mouth, but for her, just makes her look a little unhappy. I'm sure Illusion can put a smile on her face in no time though. Good luck in Barnacle Bay. I hope you have good success there. I know we've been talking about lighting mods, and I had one in when I played there. Just to warn you if things look a little different when you're there. I saw that @HollyhocksFluff thread was reopened. I'm glad they did that, I didn't understand why they closed it in the first place. They've closed one of mine too, my thread I'd made for announcing updates of my for fun saves. It's not a big deal, but it's just odd how they are picking and choosing what to close down. LOL congrats on getting the new EP. I do have both since I got them at good deals and had Best Buy points. I've not done a whole like with the clubs, but I'm trying with Anahi. I hope Marissa is able to drop those extra pounds, and it'll give her a head start when she gets to the body building aspiration. @Jazen It is her mouth that makes her look sad. Its not the case with Neal but it is on her. I'm sure that she will be happy with Illusion but I still get a gloomy read from her. Oh I remember that amazing picture you took of Grace in Barnacle Bay the lighting was so beautiful. That mod did an amazing job for you in that world. I was so happy to see @HollyhocksFluff 's thread reopened and it is so good to have her back I'm not sure why they closed the thread either as I can't figure out the reason for it. Hello again everyone, I think I might have broken through my long-time writers block with Echoes of Eternity. I feel kind of like I had been making excuses before, with not wanting to get pictures, or not wanting to make poses, but I think the truth was that I felt uninspired and didn't know what to write to make the chapter the way I wanted it to be. Today however, I wrote a chapter, and it just kept flowing, like it used to. I just wrote and wrote, and everything I was writing was stuff I liked, which to me, is how I know it's ready, and it's what I want. I still need to edit of course, and add pictures before it's ready to publish, but I want to actually DO it this time. @jazen @Piazzagirl1015 Hey guys, sorry I've been gone for a while. They've been closing threads down? That's wierd, but I guess maybe they need space on their servers? LOL, I don't know, I just pulled that one out of thin air, haha, I don't really know what happens with forum sites like this and why they do the things they do. I wonder if my Echoes update thread is still there, I haven't updated it in a while, I wouldn't be surprised if it's closed. Anyway, glad to see you have both been doing well. 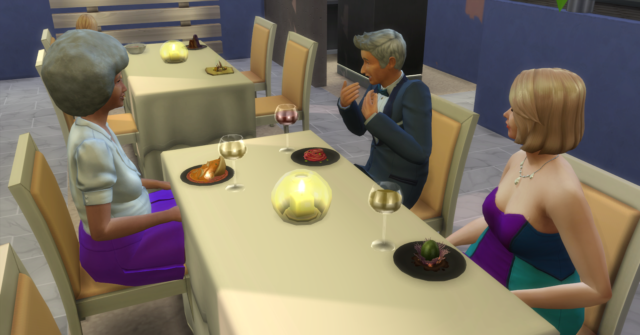 New expansions are so fun, I hope they come out with a Weight Watchers one soon, LOL, TS4 Sims just get so fat all the time, so quickly, it's aggravating. The only TS4 pack I have is the Get To Work one, and I haven't played it much, LOL, I need to explore it. But, one thing at a time, I want to get back into my story writing with TS3. @Piazzagirl1015 some features just don't translate over well. It's like George Dean, you told me he makes great looking sons, but his daughters can't handle his features as well. What are her traits? Maybe that's adding to the gloomy feeling? The lighting I had for BB during that was another by BrntWaffle. It was their fresh cut day 2.0 one. I know you put in the one they have for MH and I'm curious to see how that looks in other worlds as well. @NewToTheSims HELLO!!!! Man first SoNet, then Holly, and now you! Love that everyone is popping back in. I'm so happy to hear you have possibly broken through your funk with writing. We all know how that goes with inspiration, or a lack there of, even without the added depression you were going through. **hugs** Woot looking forward to that update. I don't think they have any rhyme or reason behind what threads get closed. I had one that got closed, it was my just for fun update thread, but Fiendish is still open and I've not updated that in over 2 years. I think your Echo thread should be fine. There have been rumors that the next EP for S4 is city related. Apartment living that sort of thing. I currently have both EPs (got great deals on them) but I've not gotten any of those stuff packs. I did get a combo game pack thing so I have spa day and outdoor living. I've been starting to explore the game more. I have 2 for fun plays in S4 right now. One is all about genetics, it is a challenge started by @OJenn called Rebuild Willow Creek. That's been fun since before I was planning to avoid babies in S4 due to the lack of toddlers. I'm making it work thought. The other one I just started is the Iron Sim challenge attached to going solo. Different type of game play since I really have to focus on aspirations and jobs, something I don't worry too much about in the other one. I have to say I am most annoyed with Windows. Yesterday I started writing up an update for this but had to leave to take Munchkin to his Tae Kwon Do class, well got back and my computer had been restarted thanks to an update. I have those things set to not be done automatically for that very reason, yet it did it anyway. @NewToTheSims Welcome back! We missed you and I'm so happy to see you back. I'm sorry to hear about the writers block which is something we have all suffered at some point. If the ideas are not coming to you than there is no way you can force it. IMO you did the right thing just let it go for a while and than come back to it when you are ready. The main thing is you come back to it. Which reminds me I was half way through Patrick before my father got sick and I had my own accident. I have to get back to that as I did like his story. You know I just checked and my A Race Against Time Thread is closed now too. I don't use it anymore so no worries but I would like to know how they decide on which threads to close or not. I just checked @NewToTheSims thread and its still open but I found that @Vuneca @Carlimact @Shafer249 @LittleMinxUndr and @SOnet104 all have GS story threads that have been closed. @HollyhocksFluff has hers reopened so I guess if we request it to be reopened they will do it. I only had the first two EPs like you until my daughter handed me one of her teacher gifts which was a $20 Amazon gift card. I figured that paying$9.99 was a good enough bargain price for Get Together. I havent played with the clubs yet but if there is a weight watchers Marissa is joining. Who knows maybe she will make her own and call it Chubby Checkers or something like that. 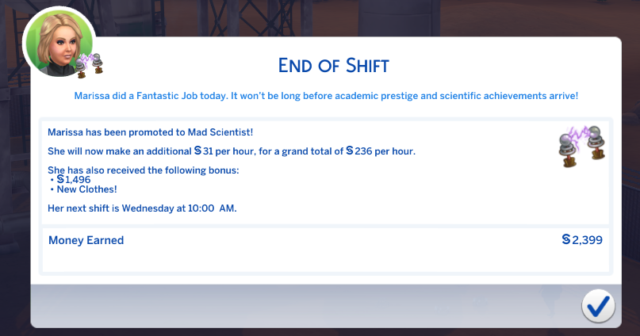 I'm almost finished the Science career and I do like the Get to Work pack. I think I will be doing Athletic next because my sim needs to lose weight from her first job in the culinary field with all that gourment cooking under her belt literally. @jazen speaking of George Dean and Raven I finally found the pictures of their daughter. I think her name was Blair I was going alphabetical at the time and using Soap Opera names. At the same time I also found a picture of Raven's son with King Lucas. His name is Adam. I'll have to check Catalina's traits the next time I go into. I know she has Angler because I sent her to Scouting instead of Ballet as a kid. The way I figure it we don't always have to send the girls to ballet and the boy to scouting but for some reason I fall into that trap. For Catalina's traits it made sense to send her to scouting. Sorry to hear about the update messing your up. I know that must have been frustrating. Off to read your update now. Hey again! Aww you guys, thanks for the warm welcome back. I missed you too. I felt bad, but I'm really glad you guys understand, LOL. Ever since I started writing, I don't think that I could stop, it's become a really fun hobby. Today I have some grocery shopping, and wedding gift shopping to do, but I am going to start getting as many pictures as I can for Echoes, and edit along the way as I put them in. @jazen *hugs back* Thanks so much. 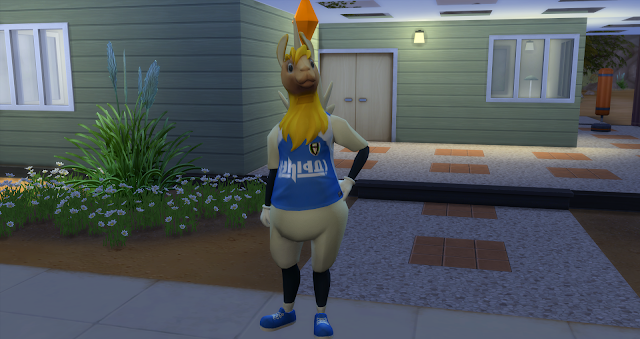 Ahh yeah, the Rebuild Willow Creek challenge. LOL. I started that one, but I didn't really keep up with it. I think I still have the save, though. City related? I love cities... although from the smiley you put after you mentioned it, I take it you aren't as excited, LOL. I still have a 15% coupon from Origin that they gave me when my account got hacked, I hope at least, LOL that the coupon doesn't expire. If it has oh well, haha, but if it hasn't, then I might get another TS4 thing. I caught back up on your going solo story last night. It was fun reading it again. @Piazzagirl1015 HI! I missed you too. Heehee. Thanks for the support. Oh yeah, I'm glad you are better from your accident. The good news is since you were still on Patrick's story, you've got a lot you can read LOL. I caught up a little on your going solo last night, but not all the way yet. Thanks for checking my thread. That was sweet of you. I'm glad it's still open. Heehee Chubby Checkers is a great name for Weight Watchers. 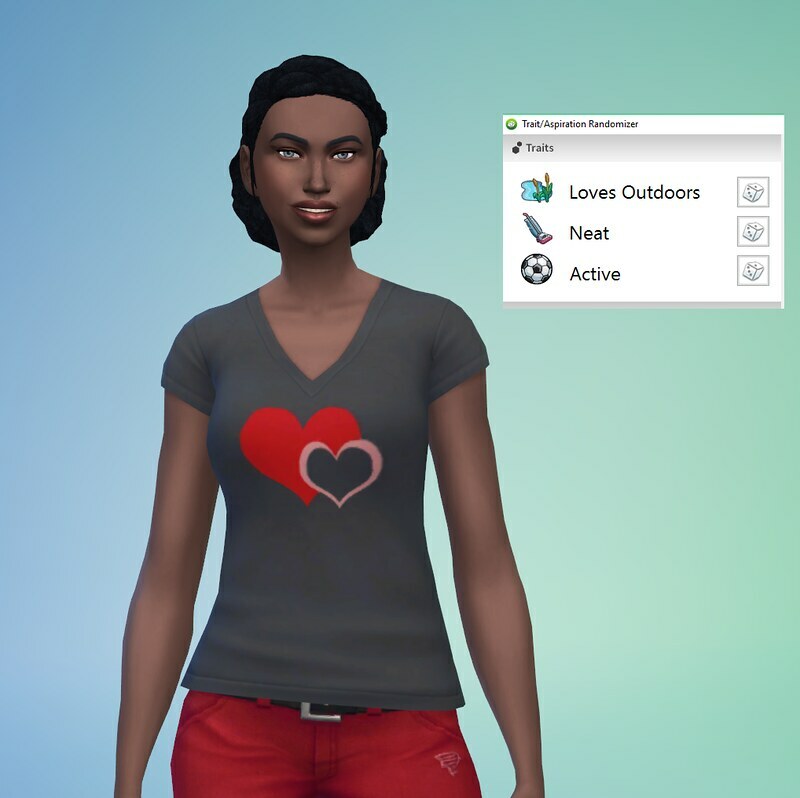 Haha, good luck to your sim on her weight loss journey. 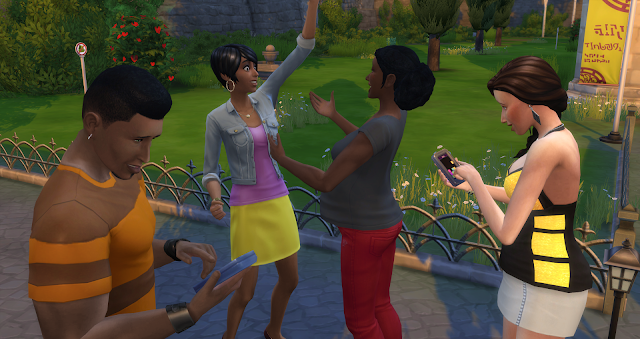 @NewToTheSims I saw your comments on the latest chapters. I'm glad you enjoyed them. I started writing the next, so just need to finish. Been doing a little at a time, mostly while I'm sitting at Tae Kwon Do. Good luck with pictures. @Piazzagirl1015 she's not terrible looking, but that is a very sharp jawline. I can see why that would be a hard thing to deal with. You'd need to find just the right hairstyle to work with that face shape. Nice, Adam turned out well. 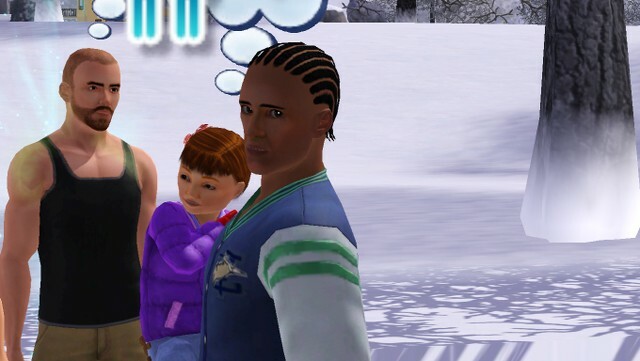 King is a great looking sim so it's nice to know he passed along those good genes. They blended well with Raven's who's been producing some good looking kids. Yay for Marissa almost being done. Soooo... I've been working through pictures today, and it's been going well, I have about half of the chapter done picture wise... But of course, LOL, now I can't find Desiree's parents' house, which I had built and thought I had put in my library so I could place the house in the town. So... of course this would happen LOL, when I'm on a roll, now I have to stop and build her a new house. *sighs* LOL. I checked a couple of different saves and no go. Oh well. Haha. @jazen Thanks! Haha, nice Tae Kwon Do. The sparring for that always made that sport look freaky. I'm like do I really want to get kicked in the face? No. I really don't. LOL. Hi, I got the chapter done, even with the problem of Desiree's house suddenly going missing. Here it is below if you'd like to check it out. 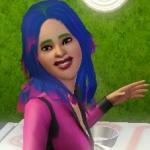 @NewToTheSims yay for getting your update done. Will read shortly. Alrighty, last update for Anahi this weekend. And I've come up with a name instead of just Iron Woman challenge. This is a very ramble-y summation of my feelings about TS4. It's ok as a stand alone game but generations behind when compared to 3. I lose interest very quickly but there are small things about it that I love. It's like I feel heartbroken from the loss unfulfilled hopes. *edit- I hit enter too soon! 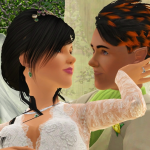 @NewToTheSims This will probably be like all hobbies where you need a break and if you do need a break from writing feel free to take it as we will always be here and we will always understand. I did see that that you commented on Race recently and I'm planning on getting caught up with comments tonight. I believe I'm halfway through Patrick so it shouldn't be long before I'm caught up with yours. So far no luck on the weight loss but that is because she is busy with her Freeze Ray and catching frogs to complete her collection. After that its off to weight watchers or Jenny Craig for her. Hopefully Marissa finishes that science career really soon so I can have her work on completing a collection full time and finishing that aspiration. I had to pick two tough aspirations to start up with her. @Vuneca Great to see you drop in here Funny you post that video as I watched it this morning before going to work. 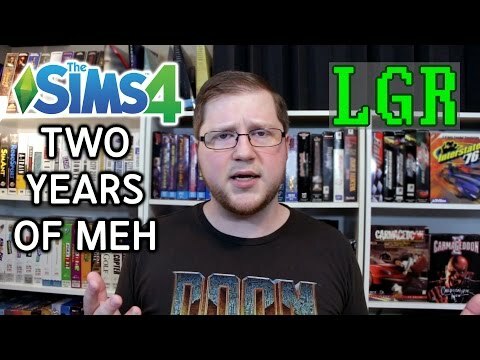 Eventhough I'm playing Sims 4 more now I agree with everything LGR said. You are right and it makes me sad to see what they have done with this game. Sims 4 was a huge step backwards for the franchaise. Its not only because of missing toddlers. open world, or color wheels but it is the basic and overall feel for the game. 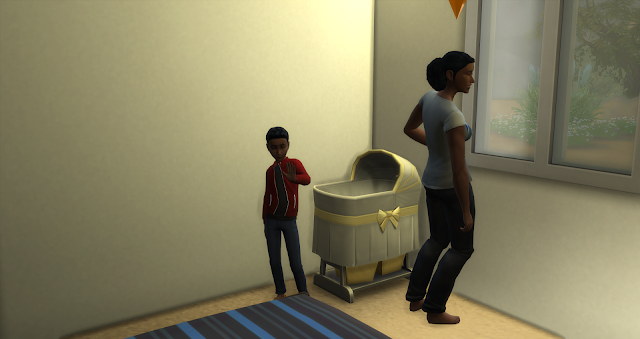 After 2 years I finally let a sim of mine have a baby in Sims 4 and I had flashbacks to Sims 1. The only thing that was missing was the pop up asking if the couple wanted to have the baby after a kiss. 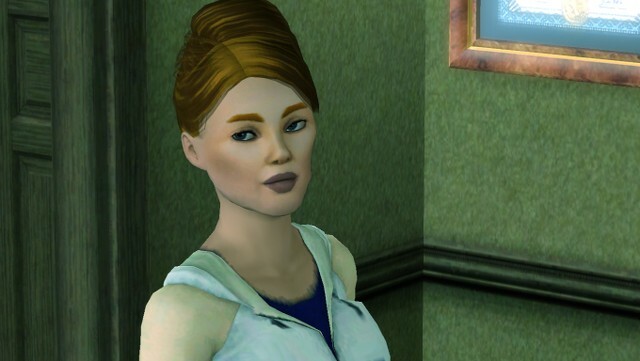 For all the problems that Sims 3 gave us and it gave us many the game still had much more depth that Sims 4 does. I can truly say that I am still learning something new about sim 3 gameplay 7 years after its release. 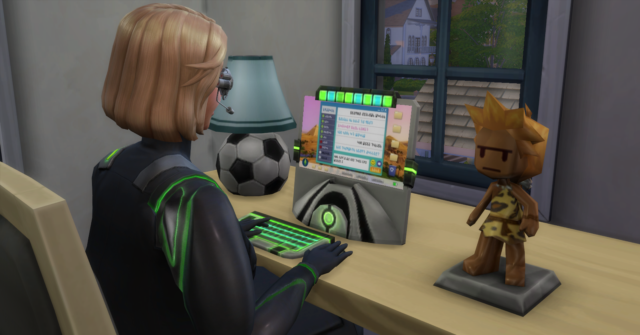 I don't think I will be doing the same for Sims 4. 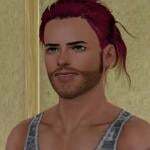 EA should have given us an improved version of Sims 3 instead of what they did. I'll still play as there are parts I like especially the easy loading times. I won't preorder EPs like I did with Sims 3 Instead I'm waiting for the bargains. @Vuneca always nice to see you drop in. Glad the updates can provide you some entertainment in your spare time. I know you don't have much these days. That is an interesting video. He does sum up what my initial feelings were about this game which is why I only recently bought it. While I am playing it I'm not in love with it. I go to it when I want to play and don't have 20 minutes to wait to load game because yes it takes me about that long for S3 with the amount of CC and mods I have. LOL He hit on a lot of good points about the future of this version and it should be interesting to see if he's correct or not. Honestly I'm like @Piazzagirl1015 I'm still learning things about S3 and I really think that by the time I finish the Iron Woman thing I'll have learned all there is for S4. I just don't think there's more under the surface with that game. 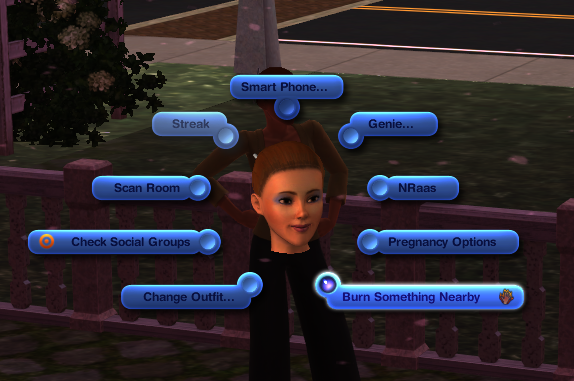 @Piazzagirl1015 Funny you mention that hidden trait, I was playing my perfect genetics challenge the other day and one of the boys aged up and on his menu he as the set fire option. Now I have no clue why that would be there considering that the parents so I am stumped. LOL I thought it was very odd thing to be there. Good luck with Marissa. I hope she finishes off that career soon. Which aspiration are you working on for her right now? @Everyone I have answered all comments I think. I know PG left one yesterday that I plan on answering today, but all others are done. @jazen You know two of Raven's had that trait and they were both genies are the two boys that have the trait with you genies? I had to look up hidden traits and I think we are both confusing Pyromaniac for Immune to Fire but I'm not sure. 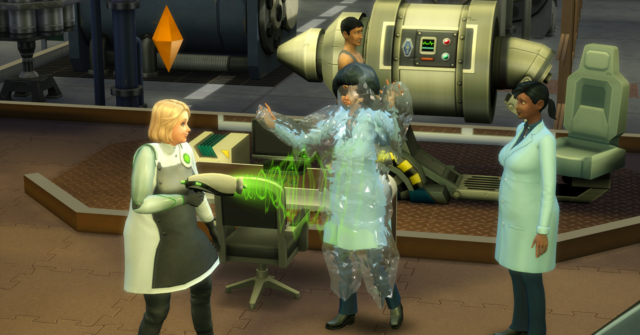 Immune to fire-Found in firefighters, Sims working in the Firefighter profession, Bonehilda, and Genies. Sims with this trait cannot be killed by fire, but can still be singed. Pyromaniac-Found only in the children of a firefighter. Pyromaniacs are able to transmogrify any fruit into flame fruit, start fires for a short time without destroying objects and can survive for up to three hours while on fire. When they are on fire their moodlet will be positive instead of negative. Bennie Dean is a firefighter which is the reason that George is a Pyromaniac. George's mother died in a fire and its speculation that a fire he started killed his mother but its not confirmed. He does have a good back story. As for my Genie girls I'm not sure now. Setting something on fire is a pyromaniac interaction but the trait they should have is Immune to Fire. 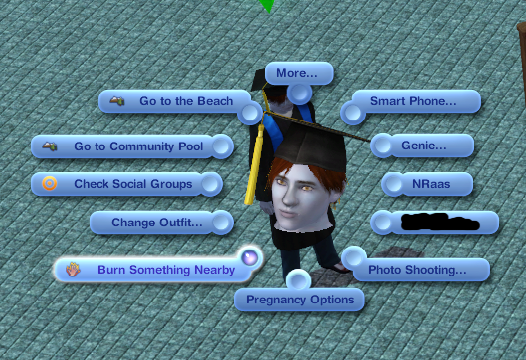 What were we saying about learning something new on Sims 3 everyday. I didn't even know there was an Immune to Fire hidden trait. Marissa is in the Curator Aspiration and she is stuck on the last one as she has to complete a collection. The first one she completed was Fabulously Wealthy which also took forever. In my Drifter game the aspiration is going much faster than either of these two. @Everyone One thing I forgot to mention about the LGR video is I really have to give him credit. He mentioned that they were going to send him contracts to become an influencer (I'm guessing would have given him some extra income even though he did not say that its only a guess on my part not a fact as there had to be something in it for him) which he turned down. It was more important for him to keep his objectivity on his reviews and say everything he truly felt good or bad than to become an influencer. I watched his reviews before this but now I have to say that his reviews just became even more valueable to me. I'm still replying to comments today slowly buy surely. I have a lot that I received in the past week so trying to catch up. He is a genie and I had no idea that they had hidden traits. Neither Kellen nor Loren have that option under their menu, so it's really strange. He's the first one to get it of the kids born into that family. Scary that George has that back story. I never knew that, but then again I never got into the backstories of the townies before. I felt the same way about LGR's review. He was honest and said that they give him the packs, but his reviews are still objective and it does say a lot that he turned down a 'job' or whatever he was offered by them. @jazen It was Lara and Teagen that had the trait in my game. They were left behind in legacy island but I had noticed the option also and took a picture of it. I have 4 other genies in my current save files. Joey and Phoebe in 100 babies and Chelsea and Catalina in Perfect Genetics. All 4 do not have this hidden trait. I guess some of them get it but not all. I'm also wondering if Genies out of CAS can get it like Kellan and Loren. So far all of mine were born into the game. I don't have Chelsea's mother around anymore so I can't check her. She was out of CAS. That Fabulously Wealthy aspiration is a mistake at the beginning so if possible try to hold off on that one. In order to complete it they have to earn 200 K and have 50 K in Reserve. I always trusted him before to give his honest opinion and many times he would say straight out that he liked whatever he was reviewing but its overpriced. His reviews are also very humorous also which I love. I see he really started something with that video because the whole forum seems to be talking about it and most are saying exactly what we just did. @Piazzagirl1015 that's crazy about the gene. Who knew? But it goes back to that still learning new things in S3. In my perfect genetics challenge the 4th babies have been born and I think they were both genies. Wonder if they'll get that trait or not. That Fabulously Wealthy sounds like a lot. I hope it doesn't come up too soon. Hayes rolled it, but since he's out of the house when he hits YA I don't have to worry about completing it for him. I was trying to save up to buy her a new house, but she may just need to stay put for a while and conserve her funds. @Jazen It really is ironic that we learned about this right after making statements about still learning new things on Sims 3. 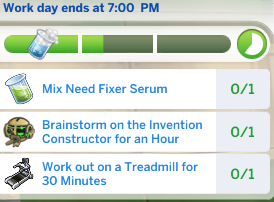 I think the trait shows up as they age to teens. In the pictures of Lara and Teagan those were both pre makeover so on the #4 babies you should check as they age up to teens. It seems like you dodged a bullet there with Hayes. Hopefully you will keep on dodging that bullet for a while. Hallelujah! The science career is finished! There she is with her new desktop for finishing the career. Raquel called and invited her to dinner this time Rowan came with them. Looks like she is going to have to look for a new best friend along with a new boyfriend pretty soon. All she needs is to finish a collection and she is onto the next. 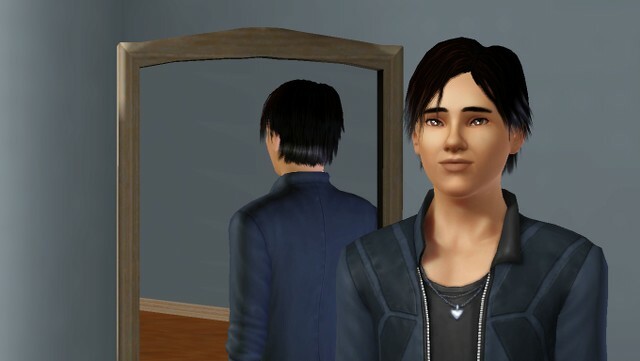 @Piazzagirl1015 I don't recall seeing that as an option for Zander when he was a teen. It's possible I over looked it, but I only noticed once he aged up to YA. Fingers crossed the randomizer is kind to me when it comes to the aspirations. 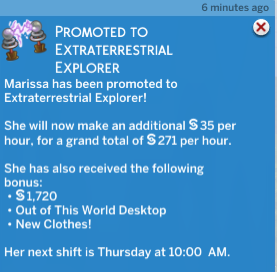 Congrats to Marissa on completing her science career! Sending luck your way that you finish your collection that's needed for her aspiration. 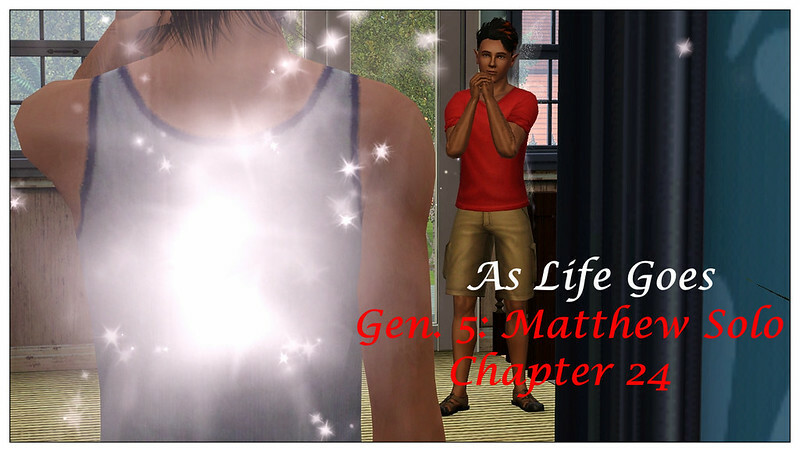 All I managed to get another chapter of As Life Goes completed so you all get an update today. Enjoy! @jazen I had to read through the above thread to realize what option you were talking about, as your photo had me laughing about another pop-up option.